There are many types of green tea out there in Japan and if you are trying to choose one without knowing what you are looking for, you might get lost. Most of Japanese green teas are steam processed. This makes richer flavor than Chinese or pan fired green tea. However, steaming process tends to bring out more astringency too so one has to know the golden rule of brewing green tea. All the teas listed here are from tea plants (Camellia sinensis). No herbal teas are included. Sencha is the most popular type of green tea in Japan. About 90% of green tea produced in Japan is some type of Sencha. Sencha literary means to make decoction of tea, yet in modern days sencha is most commonly drunk as a type of beverage. What’s commonly called sencha is more precisely Futsu mushi Sencha, or normal (steaming) sencha. Sencha emphasizes the balance of flavors (sweet, bitter, astringent and rich) and freshness of aroma. Also called Futsu Sencha, Futsu mushi Sencha. Fukamushi-cha means deep steamed tea. Compared to Sencha, Fukamushi-cha is steamed longer to suppress the astringency. Longer steaming often results in more powdery leaf and it gives richer liquid. Typical steeping time for Fukamushi-cha is shorter than Normal Sencha. 30-45 seconds. Certain tea pots are specifically for Fukamushi-cha to reduce the fine leaves mixed into the liquid. Unique characteristics of Kabuse-cha falls in between Gyokuro and Sencha for its deep rich aroma and flavor as sencha. 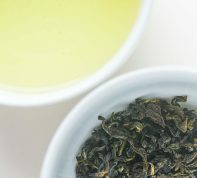 Kabuse-cha is often produced to give unique aroma of gyokuro to sencha, yet more easily enjoyed like sencha. Shading before spring harvest prevents certain types of amino acids like Theanine from turning into catechin, or tannin. Theanine is Umami and catechin is tannin. More Theanine means richer flavor. Spring sencha is stored in high mountain regions to preserve its freshness. Instead of keeping it fresh, this process was found to makes the tea richer and milder. This is a seasonal product, only found during October to December. In some areas, opening the aged tea is also ceremonial. Second harvest is less preferred to first harvest. Leaves tend to get stiff and lacks fresh green aroma. Enjoyed in hotter water than first harvest. 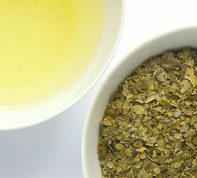 Gyokuro is a tea of its own kind. In Japanese green tea Gyokuro is generally the most expensive tea because of high labor cost and low yield. Processing is basically the same as sencha, yet it yields more artistic piece of tea because of the softer leaf. Gyokuro cultivation employs permanent shade structure. Shade cover is placed every spring. Heavy shading is very stressful to tea plants and they can only use sugar stored in previous year to grow the spring tips. Plants are generally shaped into so-called natural style which can only be harvested by hands. Due to the heavy stress on the tea plants Gyokuro is only harvested once a year. Stems are separated from the leaves. This has milder flavor compared to kuki-cha of sencha stems. Matcha is used in Japanese Tea ceremony as well as a lot of matcha snacks and drinks. Generally Matcha used in Tea ceremony is often finer grade than food grade matcha. Higher quality matcha whips more frothy, has more sweetness, less bitterness and deeper green color. Tamaryokucha is a type of sencha which lacks one of the kneading process to make it straight needle shape. Hence, the shape is curly. There are two types of Tamaryokucha. Pan-fired and steamed. Pan-fired, or Kamairi style was the original technique used for tamaryokucha learned from Chinese green tea production. Current market tendency is to produce more steamed tamaryokucha. This is steamed tamaryokucha. The character “tama” describes Jade. Flavor is similar to Sencha. This is similar to Chinese method of green tea processing. Unlike steamed tamaryokucha, pan-firing cuts down on astringency and gives refreshing roast aroma. Bancha is a part of sencha production. 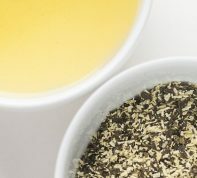 It contains stiff leaves and old growth or can also be produced from separating sencha. Generally bancha is cheap and does not have much flavor that high quality sencha seeks. Prepare it with boiling water. Hojicha is a roasted bancha. Enjoy fresh roast aroma. Originally roasted brown rice was added to bancha to add nutty flavor. Stems are separated from sencha. Unique flavor of stems. Some tips are separated by sifting from the main body of sencha because it does not retain needle shape, yet it is fine section. Often sencha that contains tips may not look uniform needle shape, but it indicates good quality. Powder is separated from sencha by sifting. During steaming old leaves tend to break into powders because they are stiff. This is often used in tea bags.